← Blog of the Year 2012 award ☆2! After making Swedish-style Meatballs with Eggnog last week, I still had some eggnog leftover. I should have made a double batch of them, but was also curious on what would happen if I baked with it. 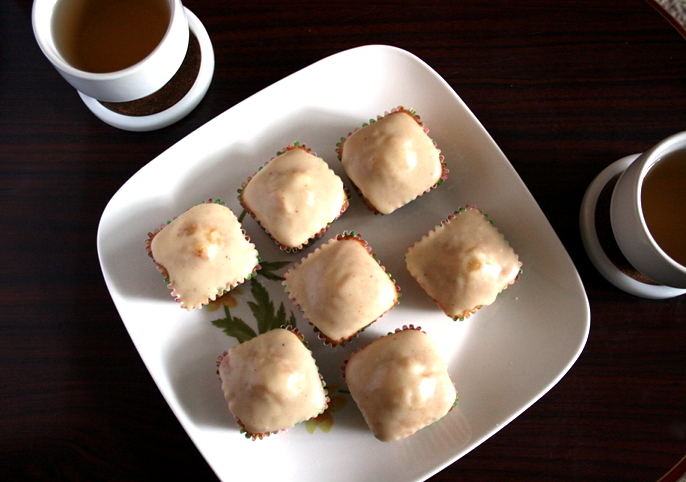 So, to appease my curiosity, last Friday I baked some Eggnog Tea Cakes. Have you ever tasted a Burbank Tea Cake? 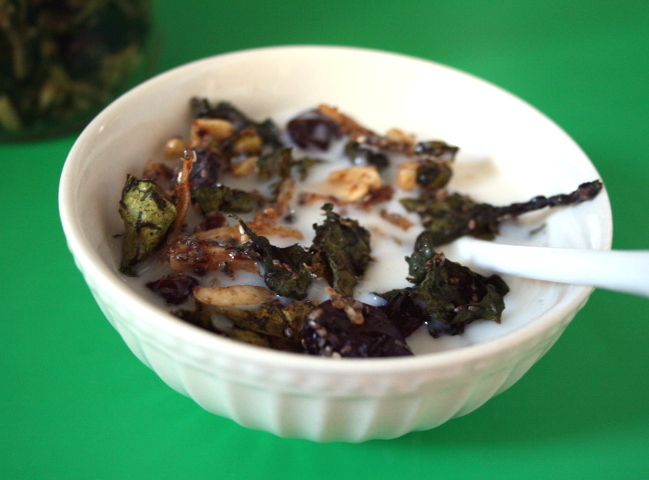 I have tasted it once or twice at my in-laws years ago while my husband (then boyfriend at the time) and I were visiting for a special occasion. I don’t remember what occasion(s) we were celebrating, but I remember those little square cakes were really good. 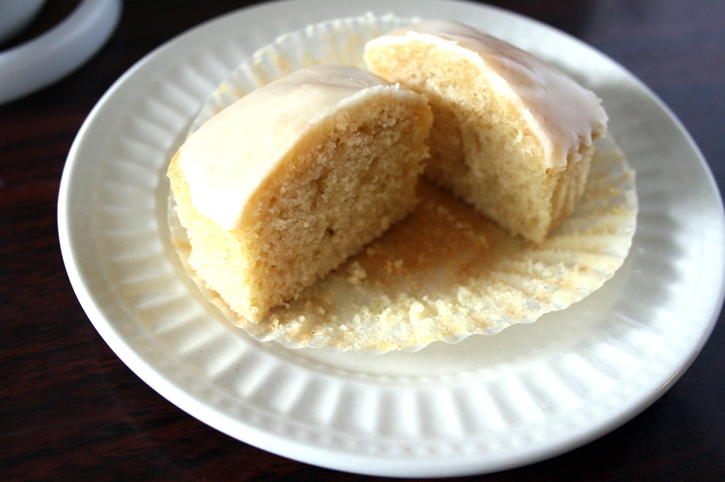 Bakeries around the area are known for the tea cakes. Even though some bakeries close down, or there are some bakery drama going on, these tea cakes still endure. Many people travel long distances just to get them. People say they are “world-famous.” Do you have any fond memories/insights into these cakes? I found a tea cake recipe online from a great blog called g-fork. 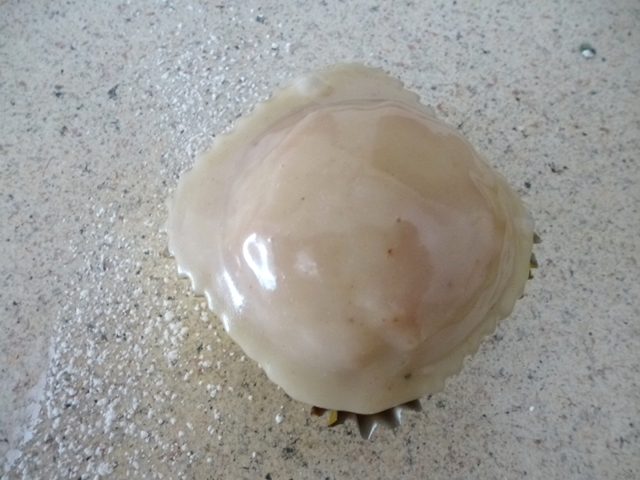 The author of the blog is the daughter of George Izumi, a baker who made these type of tea cakes from the 1950’s-80’s. I don’t know the whole story of the bakery, but it sounds like it was one of the town’s top bakeries of the time. It is so nice of her to share the recipe so that people can recreate the fond memories they had. Thank you! Someone was not pleased while I set out to bake tea cakes, though. 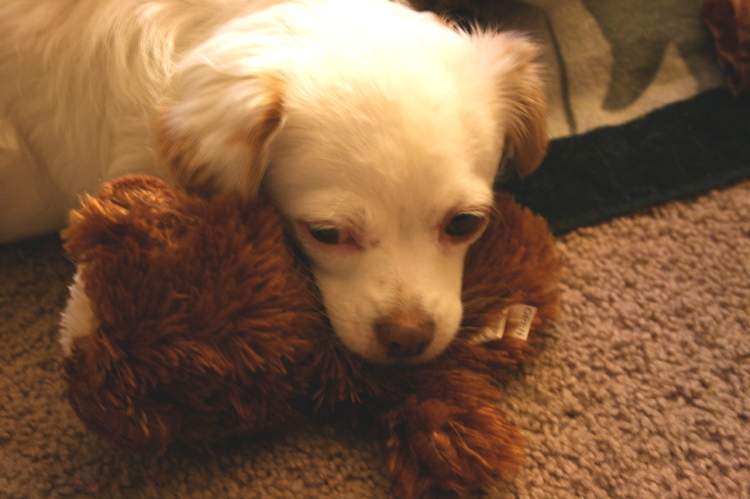 Our dog wanted to play with her new teddy bear toy. She ended up taking a nap, but woke up happy to go visit relatives. We took some of the tea cakes to some of my husband’s family that lives in Escondido, which is close to us. I hope they enjoyed it! Since the recipe calls for buttermilk and I was subbing it with eggnog, I had to get the same effect of buttermilk by acidulating the eggnog with vinegar. You can make your own “buttermilk” by adding 1 tablespoon vinegar to a 1 cup measuring cup and adding enough milk to get 1 cup. 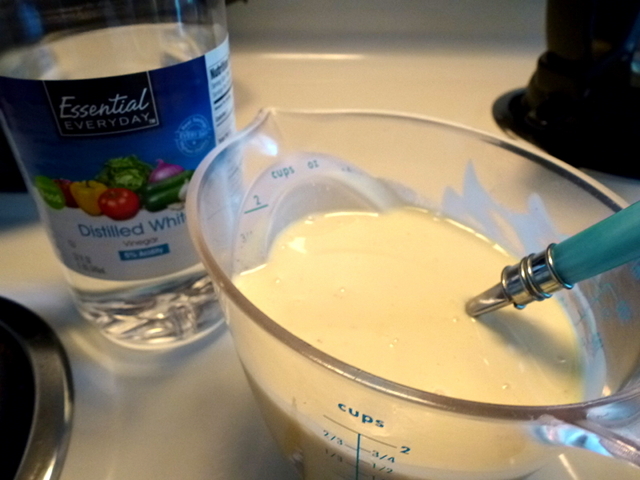 The result is a thickened milk reminiscent of buttermilk. The acidulated eggnog also got thick. Time to bake the cakes! I filled them about 2/3 full. Maybe I filled them a bit much, more like 3/4 full because I was supposed to get 24 cakes, but only got 20. Here they are after they have finished baking. Crumb shot. Nice, small holes. I think that the eggnog altered the texture of the tea cake a little bit, but it was still tasty! Probably it is because the eggnog has pasteurized eggs and extra egg changes the texture of baked goods. For the icing, I also went the eggnog route and along with a little eggnog, I added some spiced rum. What’s funny (or weird) is that I have had that bottle for at least a couple of years. I use some liquors for baking and not drinking. I suppose you can use any liquor you like in eggnog, such as brandy or maybe some Jameson whiskey? 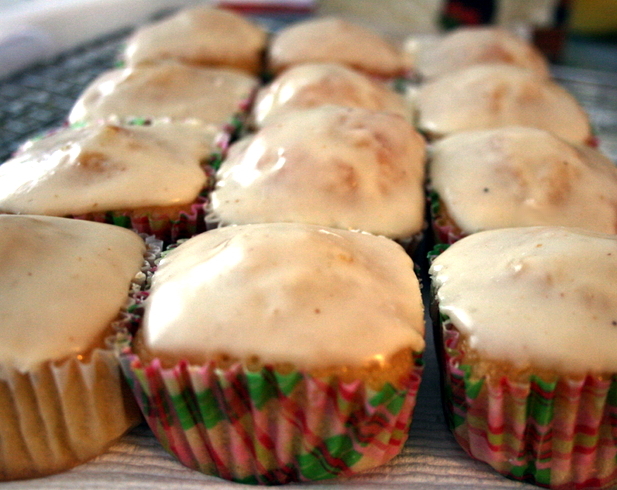 Making the eggnog-spiced icing is pretty easy, just whisk the rum, eggnog, powdered sugar, a pinch of salt, a pinch of nutmeg, and combine with melted butter. Glaze when the tea cakes when completely cooled. I made the cakes a head of time on Friday and frosted them on Sunday. 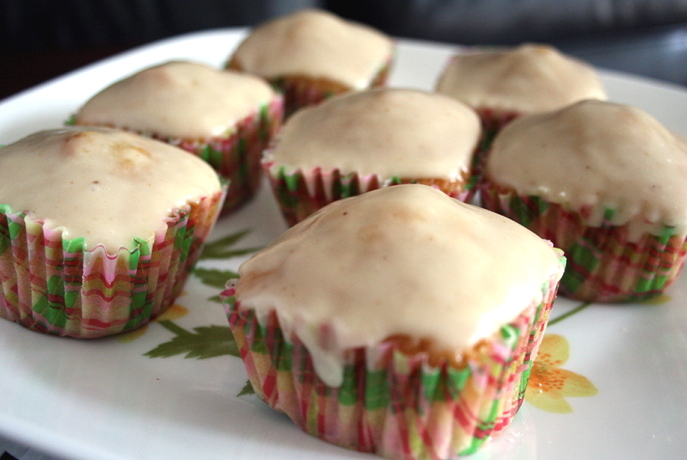 A dozen eggnog tea cakes. It does sort of remind me of eggnog in cake form. 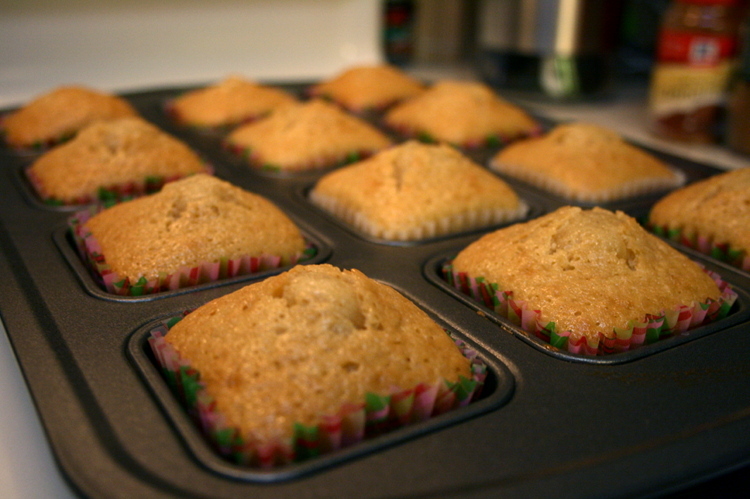 Preheat oven to 375 degrees F. Line 2 square muffin tins with cupcake liners. Make the batter: In a medium-sized bowl, whisk together the cake flour and baking soda and set aside. Using a mixer, cream together the brown sugar, extra-fine sugar, oil, salt, and vanilla for ~2 minutes until thoroughly combined and starting to get fluffier. While the mixer is on low-med speed, add the eggs one at a time. Cream for 6 more minutes and scrape down the sides of the bowl every now and then. 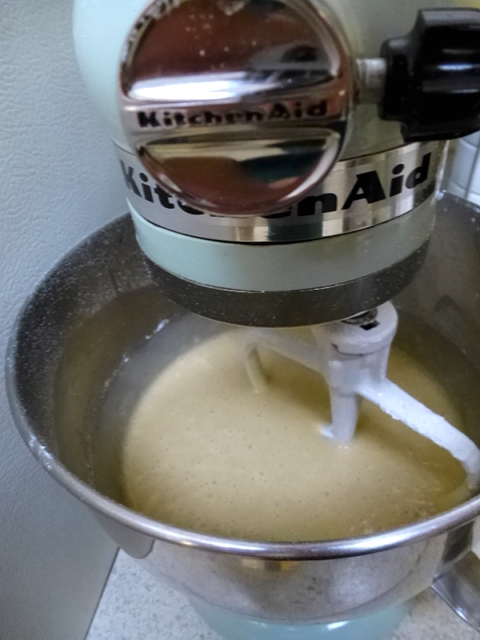 Keep the mixer on and add half of the acidulated eggnog and all of the dry ingredients. Mix until smooth. Then add the last half of the acidulated eggnog and mix until smooth. Fill the lined muffin cups ~2/3 full. Bake for ~20 minutes or until golden brown and toothpick inserted comes out clean. 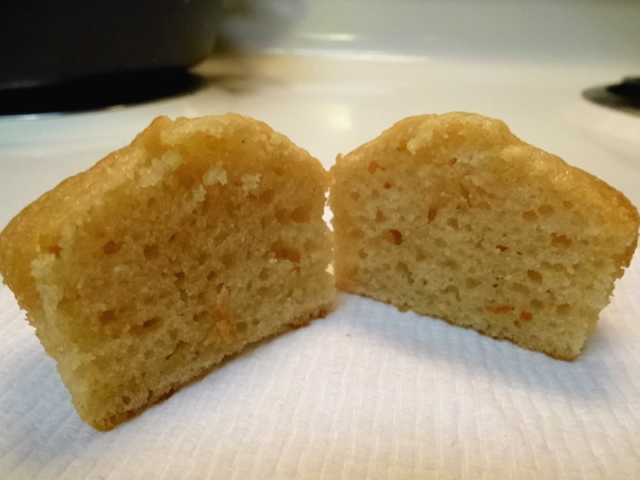 Let the cakes cool in the pan for 5 minutes and then continue to cool on a wire rack. Make the icing: In medium sized bowl, whisk and combine the confectioner’s sugar, salt, nutmeg, cinnamon, vanilla, eggnog, and rum. In a saucepan on low heat, melt the butter until golden brown. 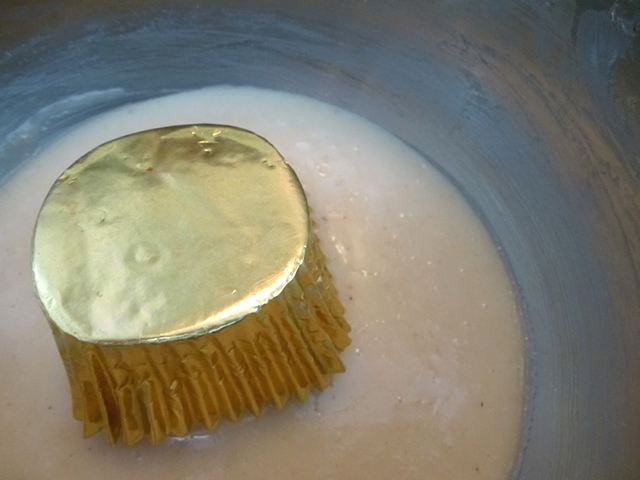 Add the browned butter to the sugar mixture and whisk until smooth. Glaze: While the icing is still warm. 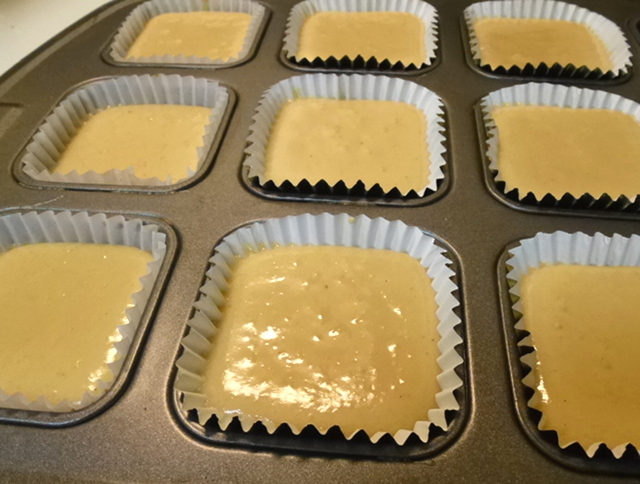 dip the tops of the cooled tea cakes into the icing. Place on a wire rack to set the icing. Repeat for all the cakes. Make sure not to pile on too much icing. Done! You could also make these cakes without eggnog. Just use buttermilk and add a pinch of nutmeg (and cinnamon if you like). For the icing, just use 1 tablespoon of hot water instead of the eggnog. This entry was posted in Baking, Food, Holidays, Recipes, Snacks and tagged baking, Burbank Tea Cake, Cake, Eggnog, Grace's Pastries, KitchenAid, Martino's Bakery, rum, spiced rum, tea cake, teacake. Bookmark the permalink. OMG!!! those look delicious. I will have to try them.Great post. Thanks for sharing recipe. I am not lying when I say..I make a Eggnog cheesecake this morning. The recipe did call for brandy but I also put Rum!! Of course I didn’t have any real rum so I used imitation. Still planing to except Blog award of the year 2012. just so busy. Will try to get on it tomorrow. An eggnog cheesecake sounds really good! I didn’t want to bother with buying another type of sugar, so I just put my normal cane sugar, which I prefer over granulated sugar, in the spice grinder (don’t have a food processor). Looks like red velvet whoopie pies. I hope it was still tasty! Thanks, your blog is very interesting. Looking forward to reading more.